I'm one of today's best-selling computer book writers, with more than 15 million books in print. This website keeps you up-to-date on my books, and your computers. Each week, I answer a reader's question on-line. 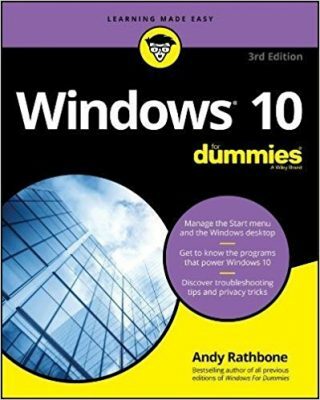 Windows 10 For Dummies, Third Edition on sale now! Drop by Amazon.com for big discounts on Windows 10 For Dummies, Third Edition. Where's the Clipboard Viewer in Windows XP? How do I make Internet Explorer open in full-screen mode? What's the difference between a System Image and a regular backup in Windows 7? What's the difference between a System Recovery disc and Windows 7's System Repair disc? Why does Windows show my file names in green letters? How do I right-click on a touch-screen tablet? janice lee on What’s the difference between a System Image and a regular backup in Windows 7? How do I know if my computer has the Anniversary Update installed? Posted: September 25th, 2016 under Books, Windows 10, Windows 10 For Dummies Second Edition. Updated to cover Microsoft’s new April 2018 update, Windows 10 For Dummies, Third Edition is available now from Amazon. Have a question about the book? Ask me! Don’t have my book? Then take advantage of Amazon’s discounts on Windows 10 For Dummies, Third Edition now. Posted: August 9th, 2016 under Windows 10, Windows 10 For Dummies. What’s in Windows 10’s Anniversary Update? Posted: August 7th, 2016 under Windows 10, Windows 10 For Dummies, Windows 10 For Dummies Second Edition. Posted: April 21st, 2014 under Books, Internet, Windows 8, Windows 8 For Dummies, Windows 8 For Tablets For Dummies, Windows 8.1, Windows 8.1 For Dummies. How does Windows 8.1’s “Update 1” change my computer? Posted: April 8th, 2014 under Books, Software, Surface For Dummies, Windows 8.1, Windows 8.1 For Dummies.